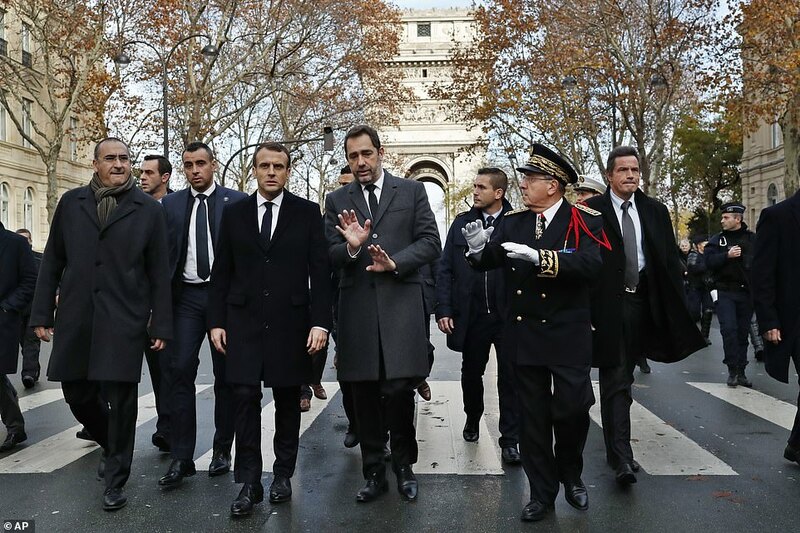 The French President – who faced calls to resign from protesters who scrawled anti-Macron slogans on the Arc de Triomphe – today vowed to bring the rioters to justice as he inspected wreckage on the Champs-Elysees. 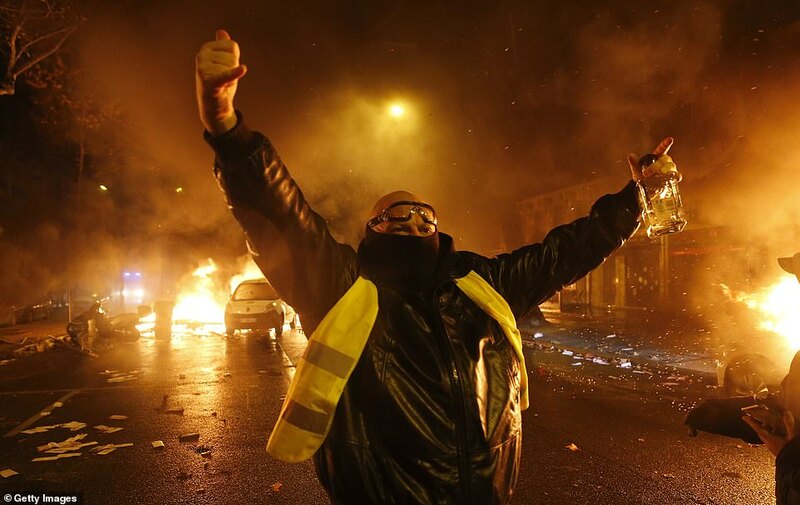 The ‘yellow vest’ protests, which began as a rebellion against a fuel tax hike but have expanded into weeks of civil unrest, spread across the country yesterday and ended with 133 people injured, including 23 police officers, and 412 arrested last night. 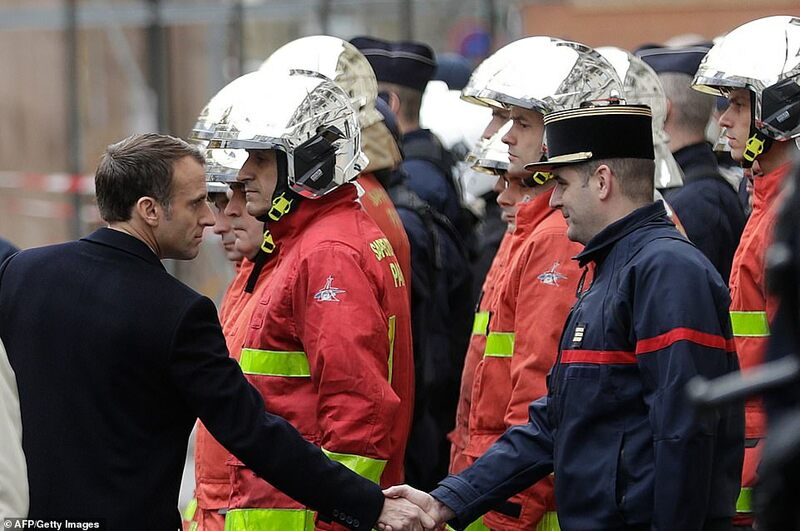 Macron was jeered by lingering yellow-vest supporters before chairing a crisis meeting with ministers, amid calls to declare a state of emergency or even send in the army to quell the violence. 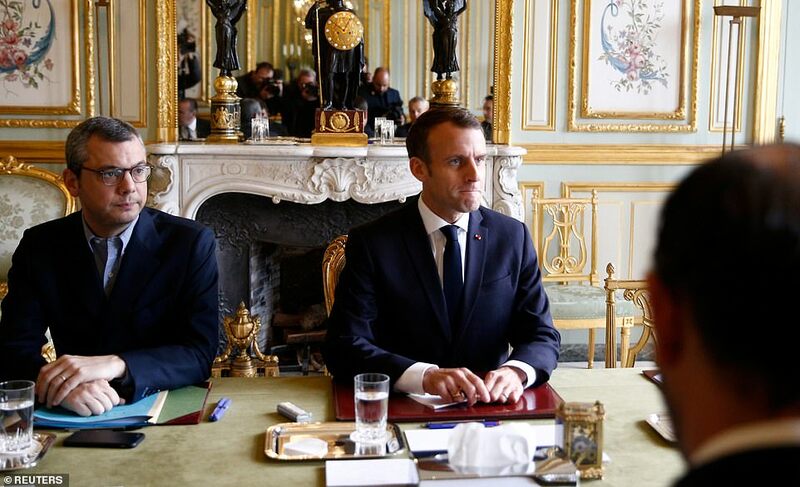 Macron, who went to Paris as soon as he returned from the G20 in Argentina today, held talks with his prime minister and interior minister at the Elysee Palace nearby. 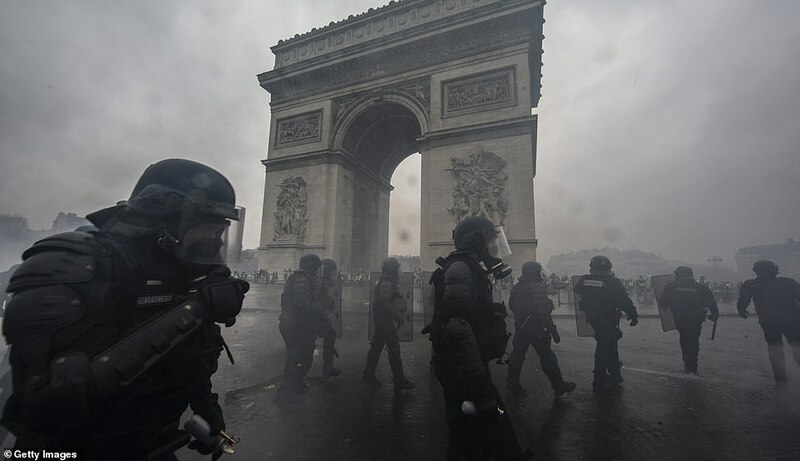 Images showed the inside of the Arc de Triomphe ransacked, with a statue of Marianne – a symbol of the French republic – smashed and graffiti sprawled on the exterior. 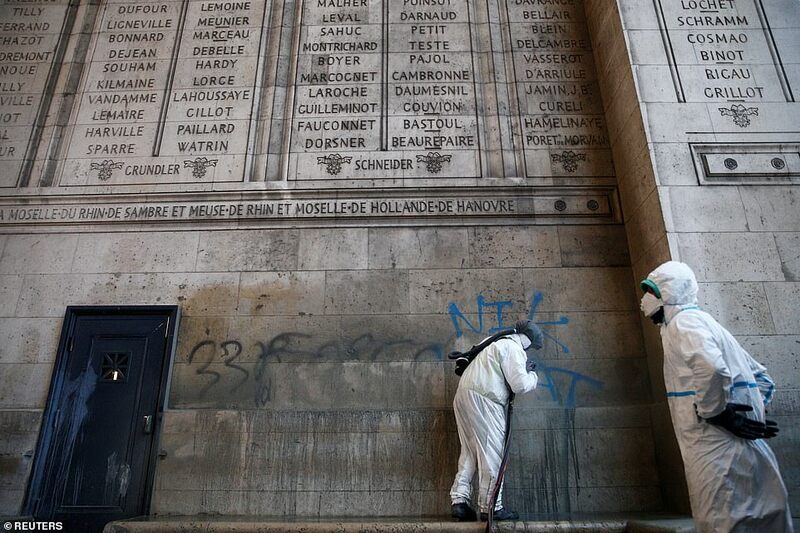 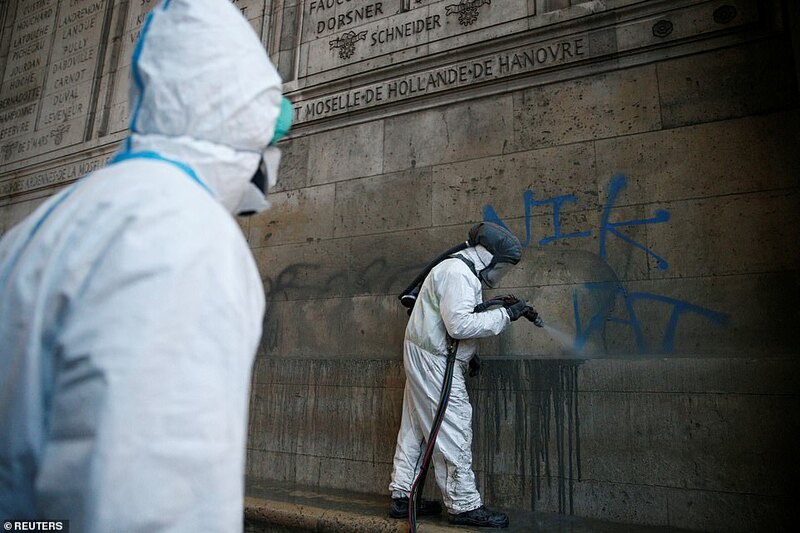 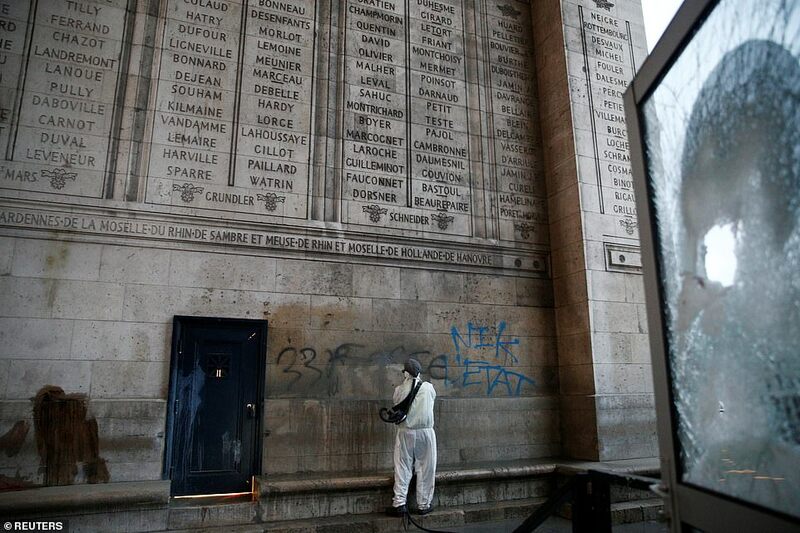 As the clean-up began today workmen cleared away burnt hulks of cars, scrubbed the defaced Arc de Triomphe and replaced the shattered windows of luxury boutiques in Paris. 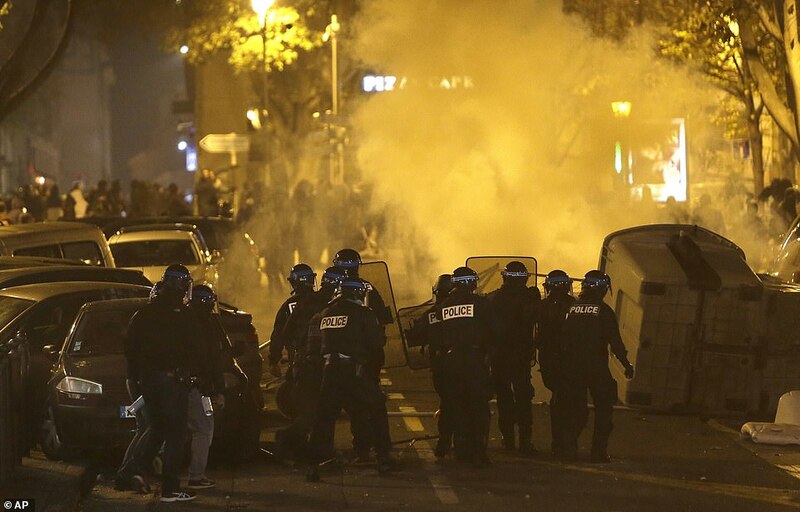 A government spokesman said it was ‘out of the question that each weekend becomes a meeting or ritual for violence’ after a second consecutive Saturday ended in violent carnage in Paris. 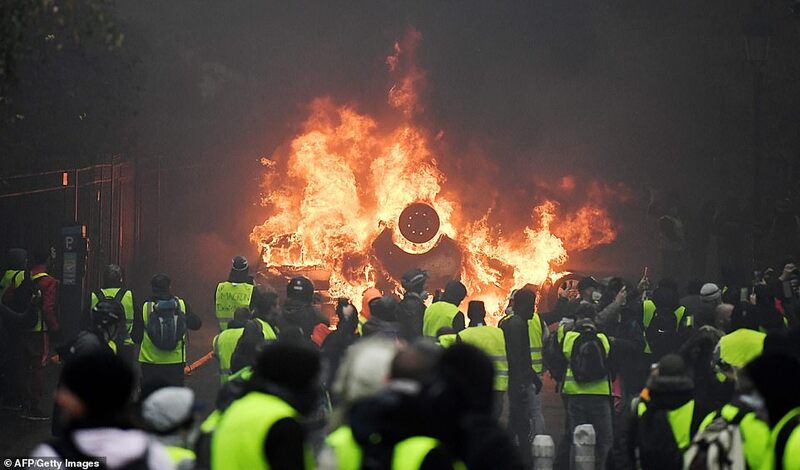 The capital was calm today but a motorway was blocked by yellow-vested protesters in Lyon, and groups sprung up on social media calling for an ‘Act 4’ next week after three Saturdays of protests. 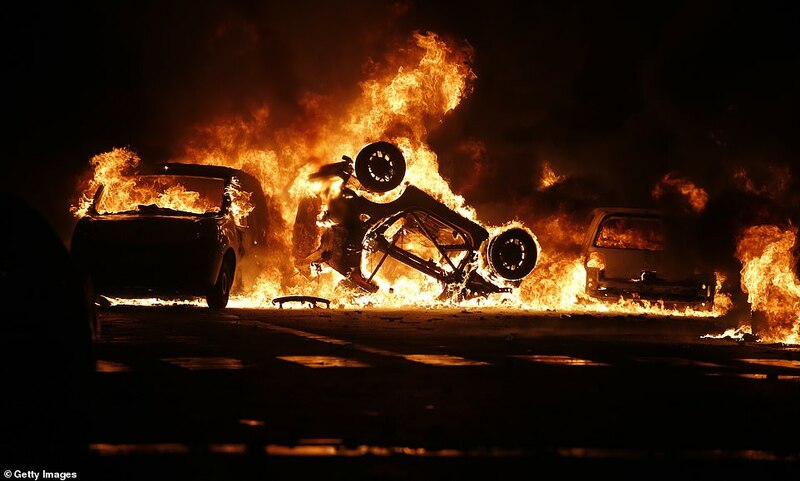 A state of emergency would allow extra powers to the forces of law and order, ranging from stop-and-searches to carrying out raids on the homes of suspected rioters, amid calls for the army to be called in. 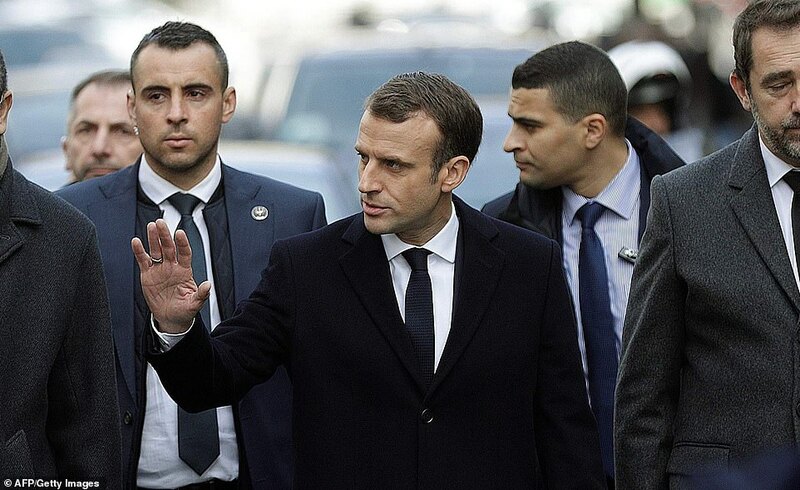 However, a source at the Elysee Palace said this afternoon that Macron had not discussed a state of emergency with ministers today. 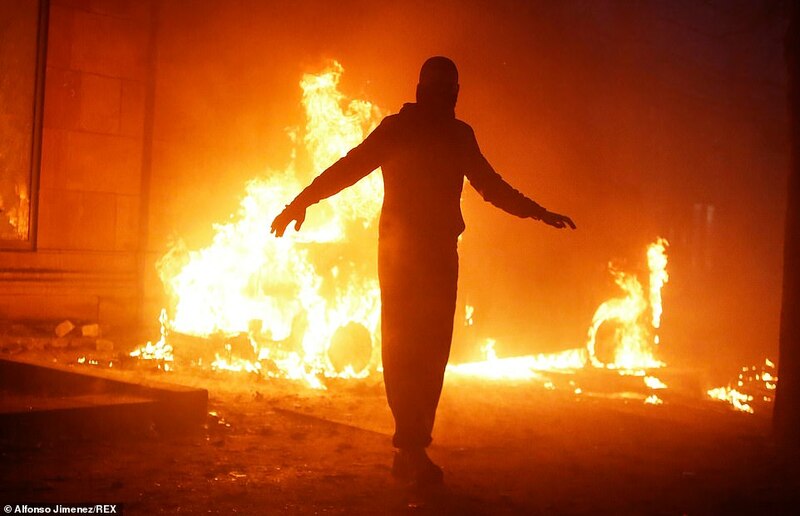 His office said in a statement that the president had asked his interior minister to prepare security forces for future protests and his prime minister to hold talks with political party leaders and representatives of the protesters. 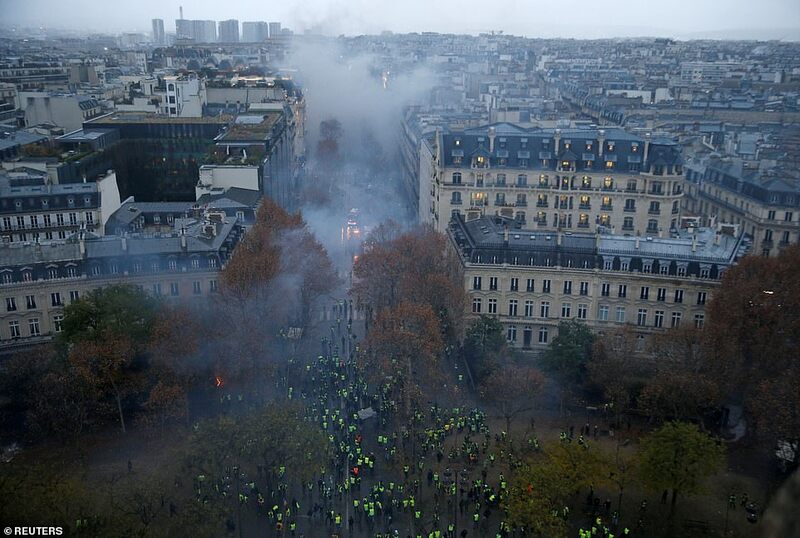 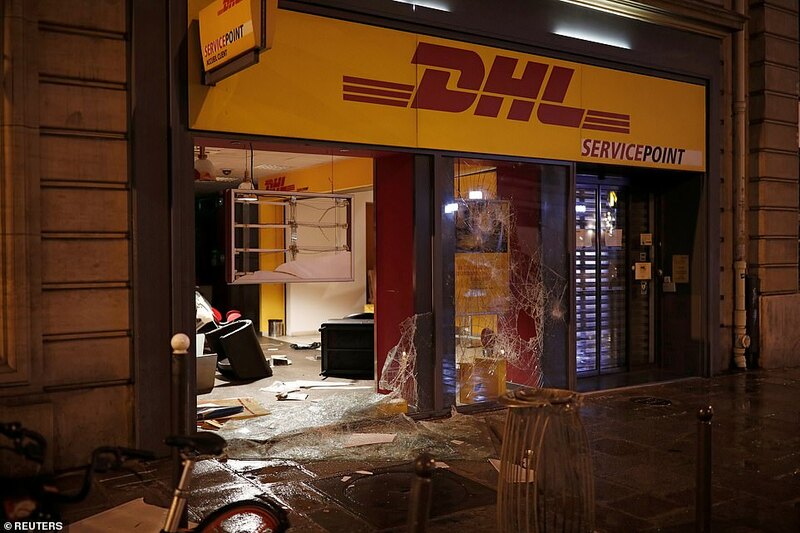 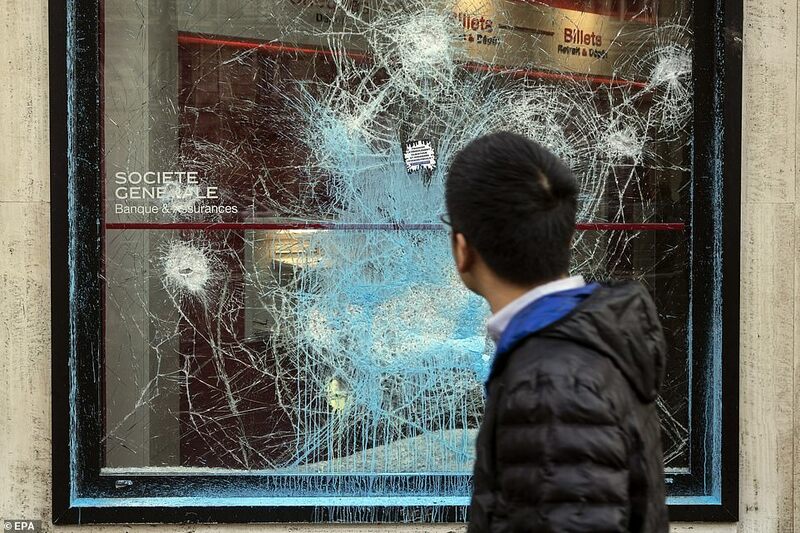 The Arc was among hundreds of buildings attacked by the protesters on Saturday as the Champs-Elysees was reduced to a warzone in the centre of the French capital. 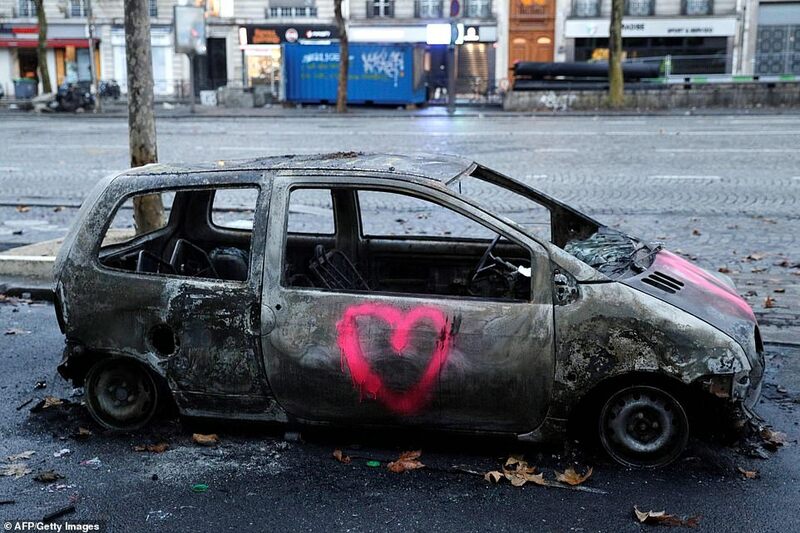 Protesters set fire to cars and Christmas trees, hurled barricades at police, smashed up windows and graffitied the 19th-century arch – while calling for Macron to resign – in violence which continued into the night. 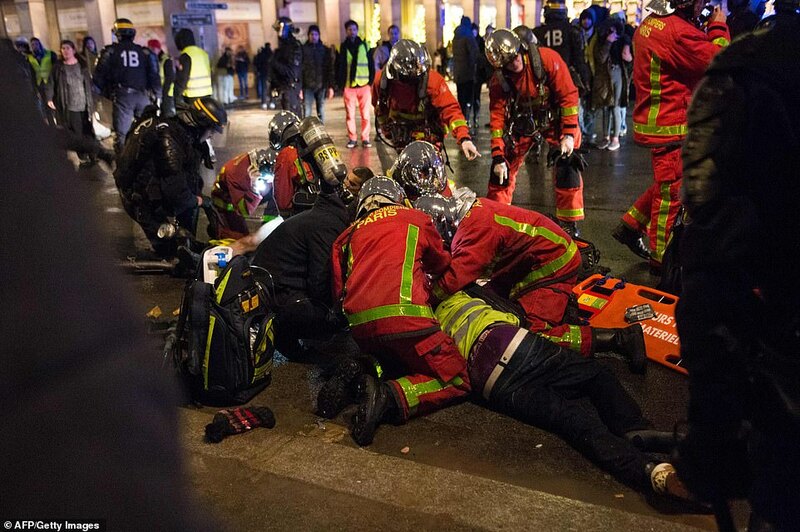 France last brought in a state of emergency in 2015, following terrorist attacks by Islamic State, which lasted until November 2017. 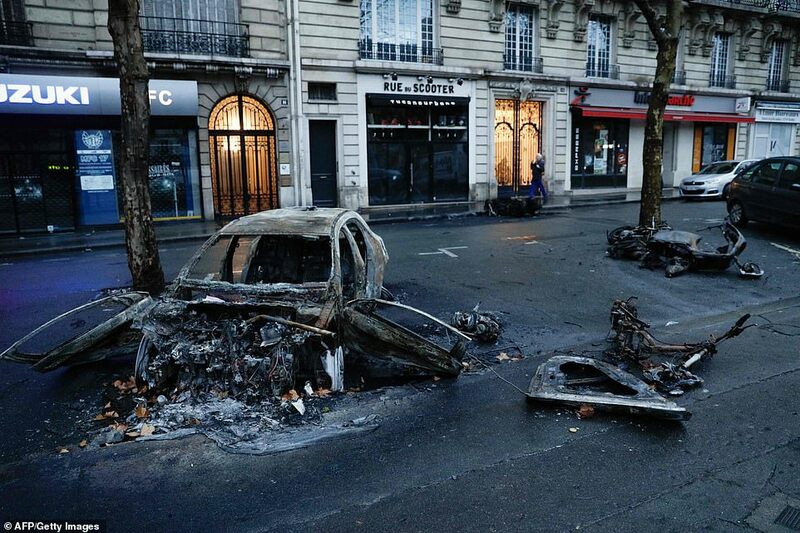 Protesters said the riots yesterday were the ‘start of a revolution’, in violence which echoed the near-revolution of 1968. 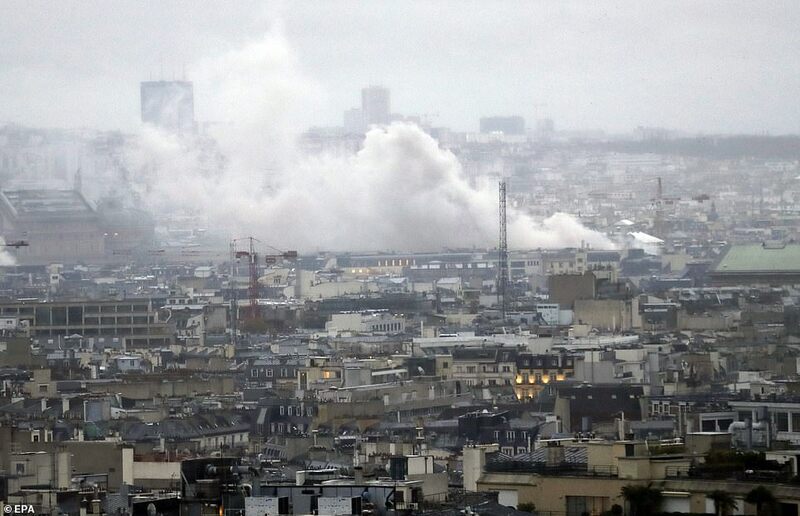 ‘We are in an insurrectional climate,’ said Frederic Lagache, of the Alliance police union, which called for the State of Emergency. 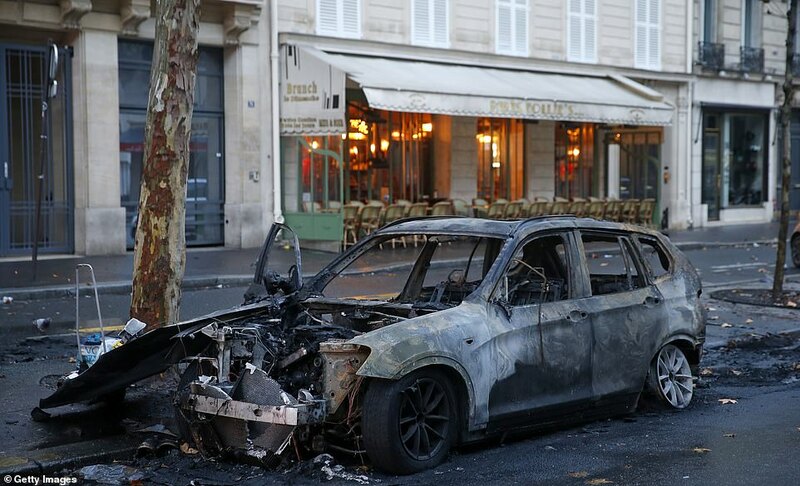 Mr Lagache said ‘army reinforcements’ should be brought in to guard public monuments, freeing up the police to deal with other trouble spots. 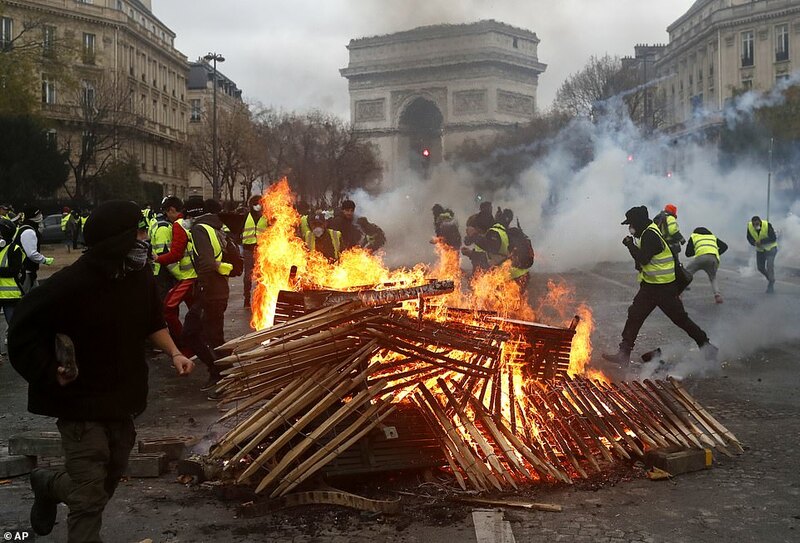 Sixteen identity check points and police barricades had been set up on the Champs Elysees for the first time in its history in an attempt to avoid rioting but the measures failed to halt the anarchy in Paris. 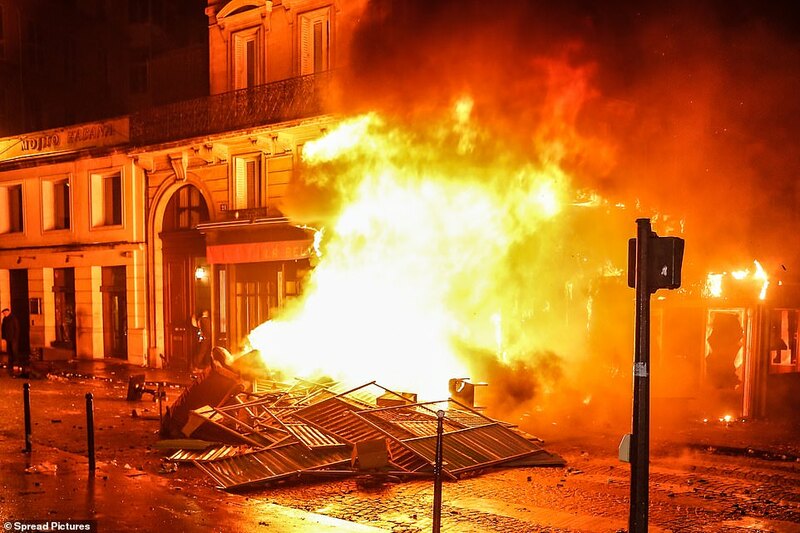 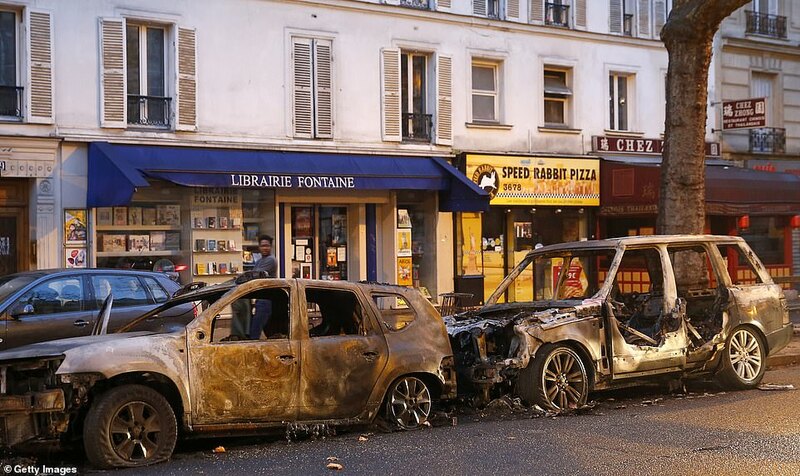 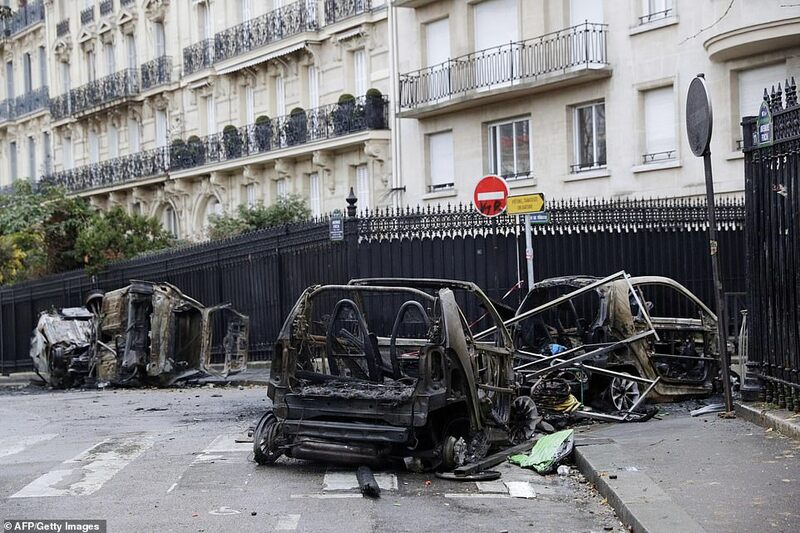 Condemning the violence, Macron said: ‘No cause justifies that authorities are attacked, that businesses are plundered, that passers-by or journalists are threatened or that the Arc du Triomphe is defiled. 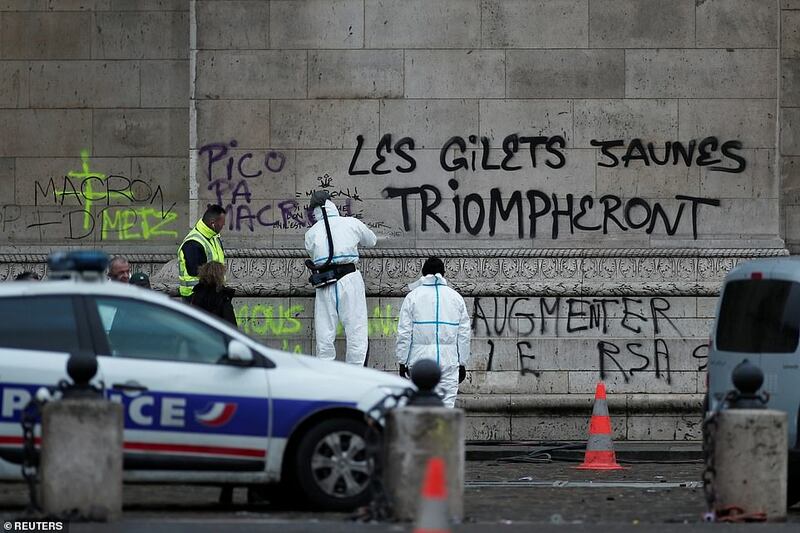 ‘Those guilty of this violence don’t want change, they don’t want improvements, they want chaos. 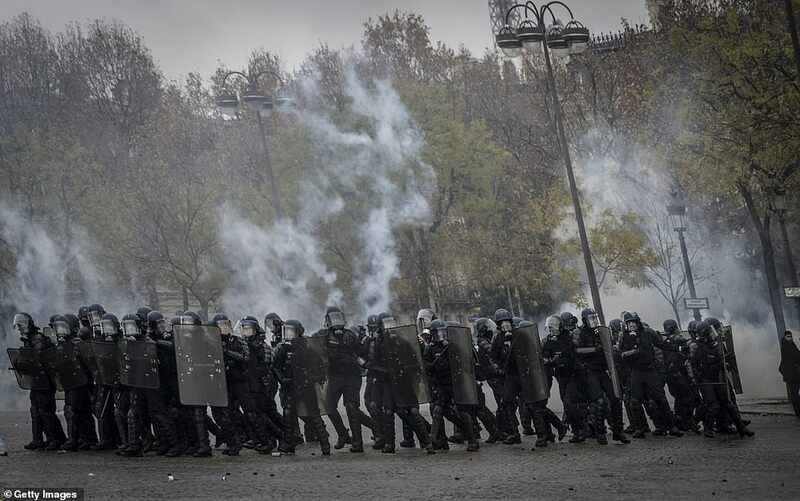 They betray the causes that they pretend to serve and which they manipulate. 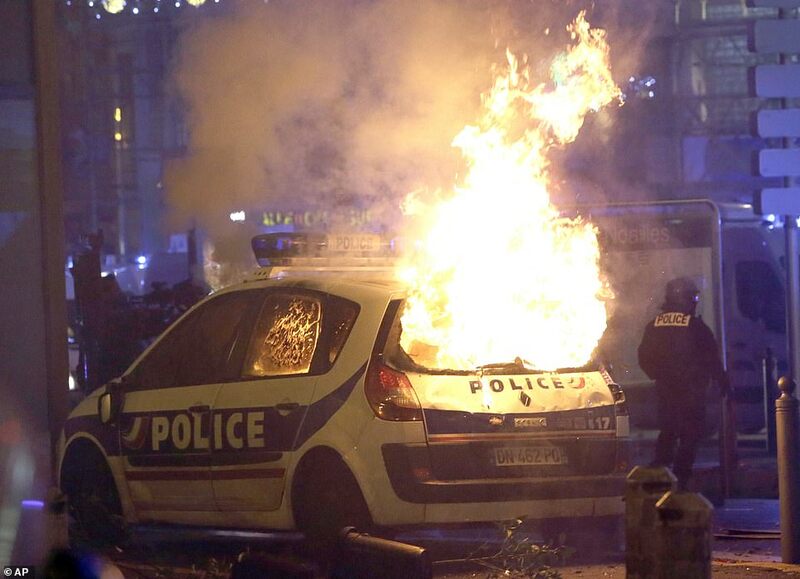 ‘They will be identified and brought to justice for their actions. 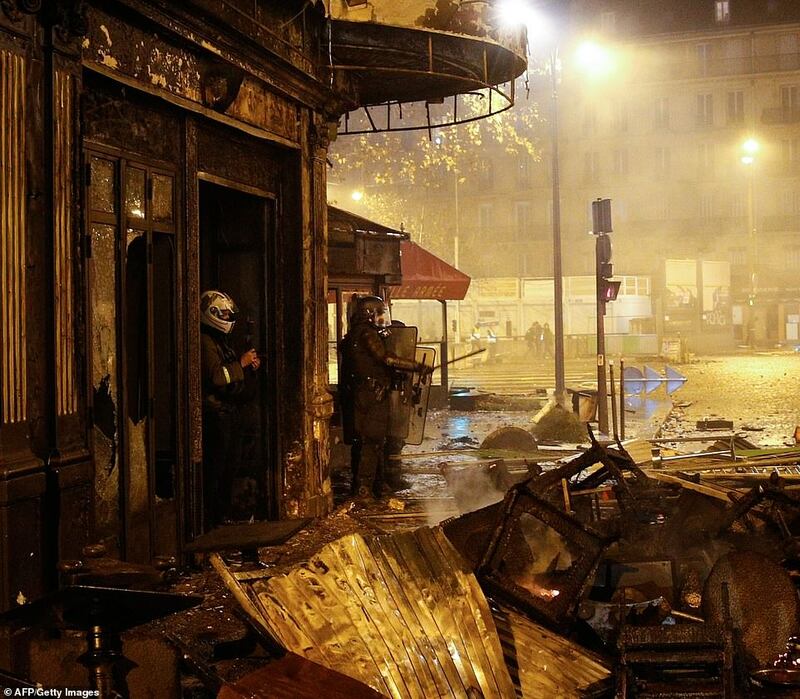 I will always respect debate and I will always listen to opposition but I will never accept violence’. 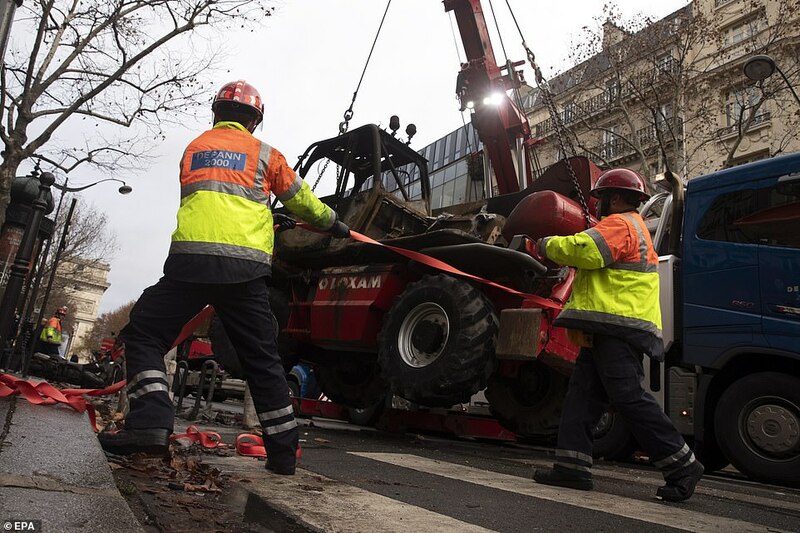 The ‘yellow vest’ or ‘gilets jaunes’ movement was first prompted by Macron’s move to raise the price of diesel fuel in a bid to encourage less polluting cars. 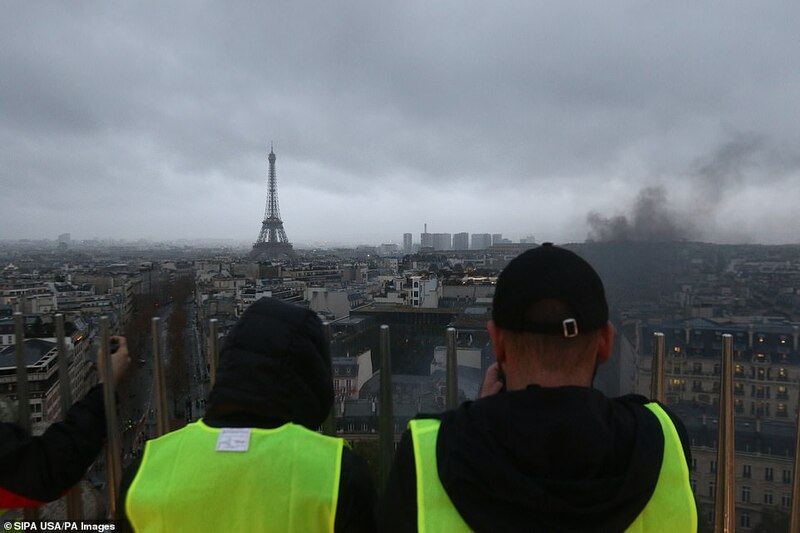 Motorists took to the streets wearing the high-visibility yellow jackets which drivers are required to carry in their vehicles in France, giving the movement its name. 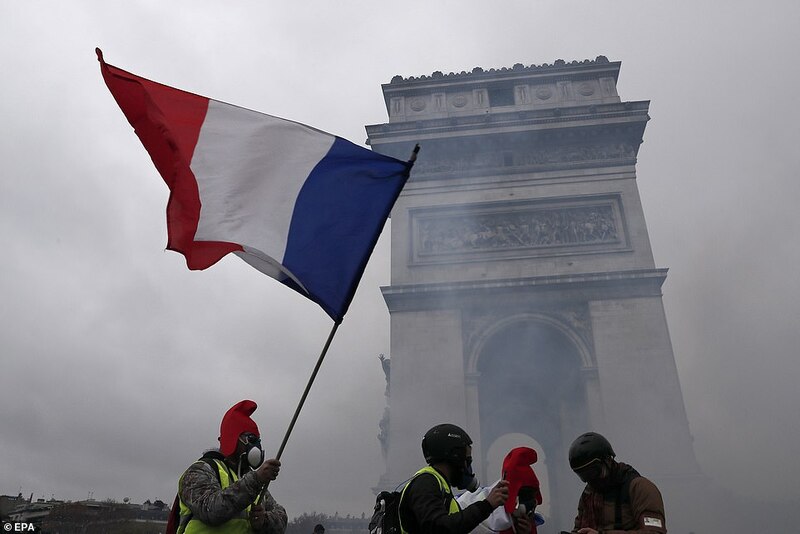 Since then the protest has gathered momentum and taken aim at the high cost of living and wider dissatisfaction with Macron’s presidency. 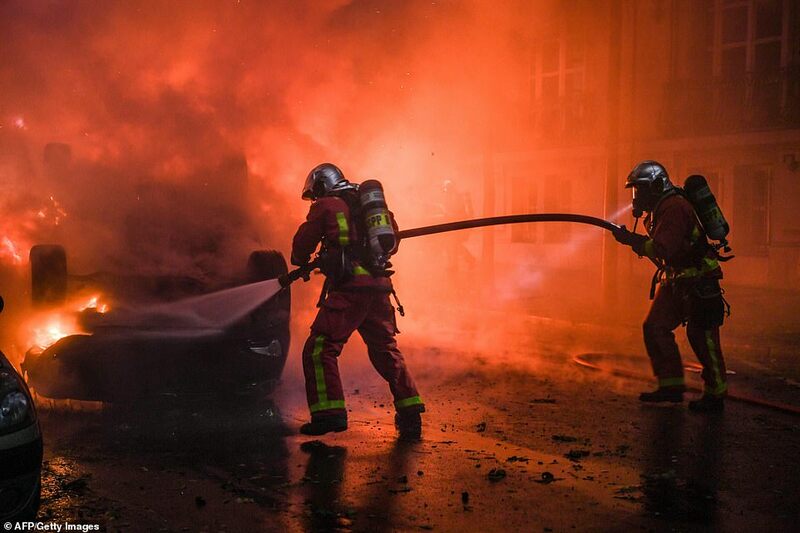 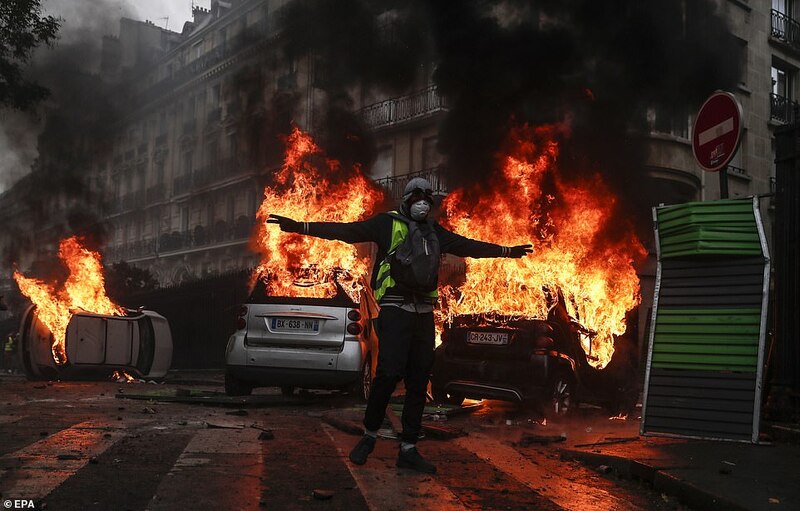 The protests yesterday spread beyond Paris as demonstrators wearing the same high-vis vests blocked a motorway in Biarritz in the south-west of the country and let off yellow smoke grenades in Marseille, France’s second-largest city. 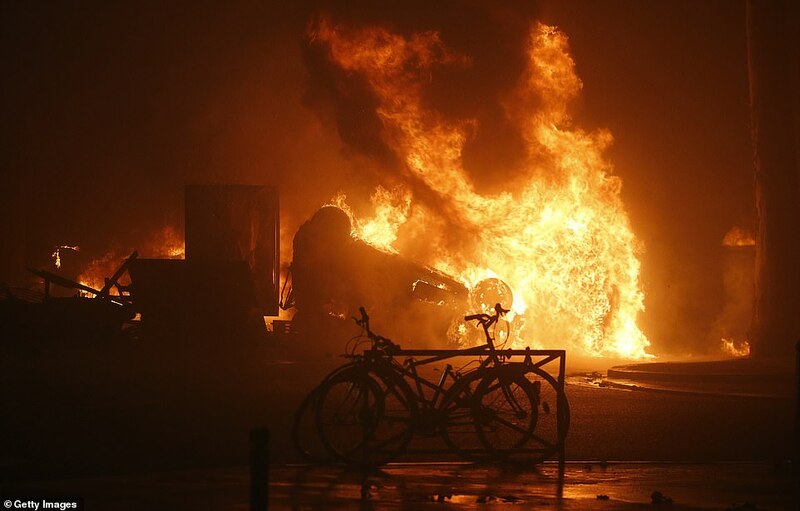 The yellow-jacket protests even spread to The Hague, in the Netherlands, where people gathered outside the Dutch parliamentary building on Saturday. 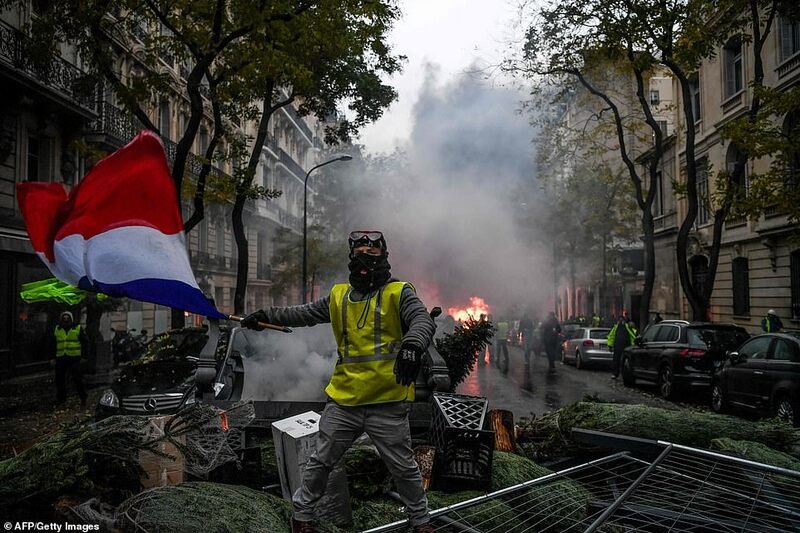 Macron has sought to douse the anger by promising three months of nationwide talks on turning France into a low-carbon economy without penalising the poor. 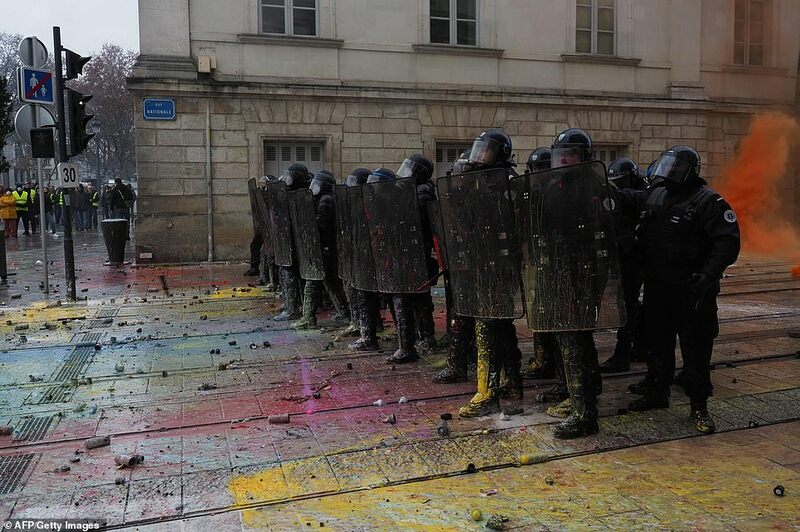 On Friday, the government tried – mostly in vain – to talk to representatives of the movement. 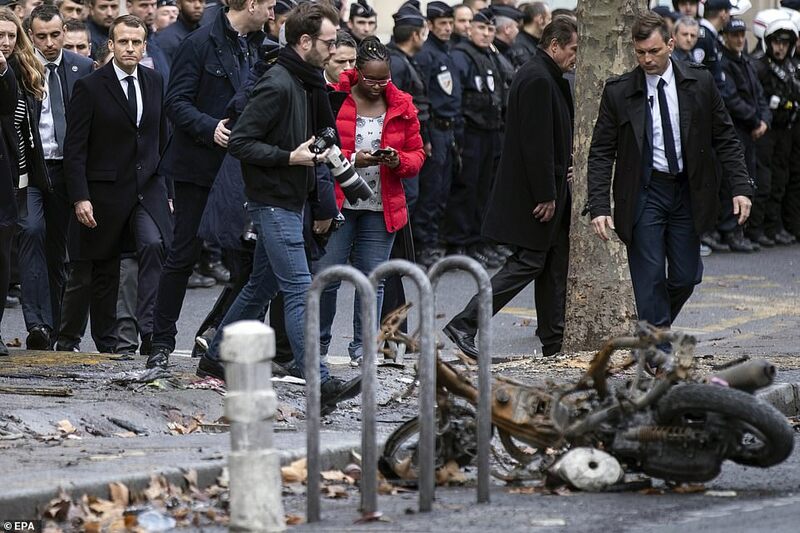 Eight were invited to meet Prime Minister Edouard Philippe but only two turned up, and one walked out after being told he could not invite TV cameras in to broadcast the encounter live to the nation. 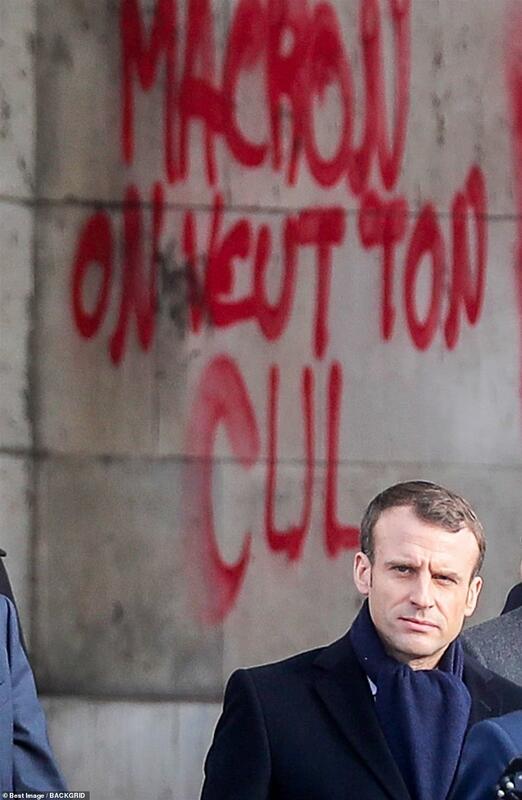 The protests have caught Macron off guard just as he was trying to counter a fall in his popularity rating to 30 per cent. 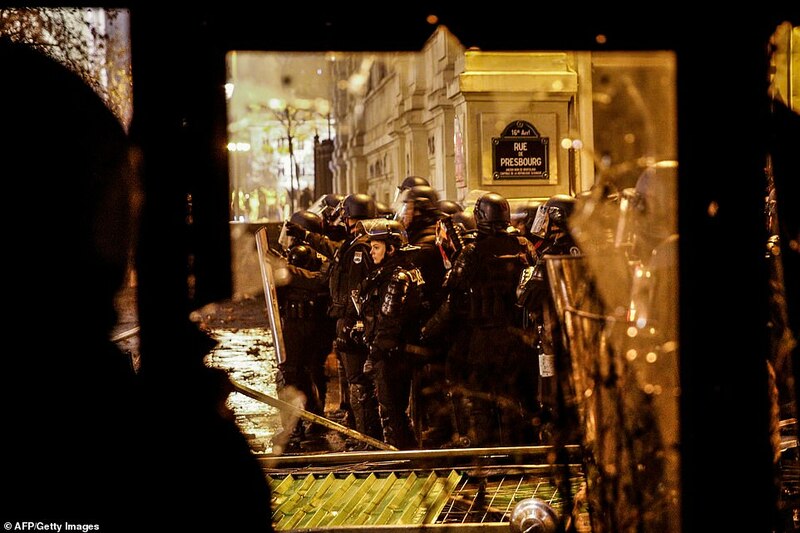 His unyielding response has exposed him to charges of being out of touch with ordinary people.